After the funeral is over, there may be a need to create a permanent marker, monument or memorial to mark the dedicated resting place for your loved one. We have helped hundreds of families down through the years through our Alexandria Memorials, a division of our Park View Cemetery. 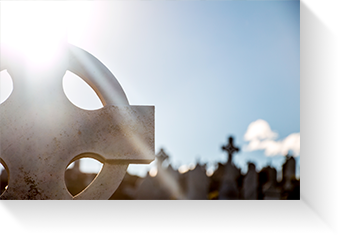 Whether your need would be a simple marker or the creation of a family burial estate, you will find our experience invaluable. We shop several different granite vendors to obtain your desired granite at the most competitive pricing. Please give us a call at 765-724-1103 or e-mail us at parkviewcemetery@comcast.net to discuss your needs without obligation. Creating a lasting tribute can give family and friends a permanent place to visit when they need help feeling connected to the loved one who has passed. It serves as a focus for their memory and provides a private space for reflection and peace. It can also serve as a location for family and friends to commemorate important occasions and can help make it easier to cope on meaningful dates like birthdays or anniversaries. As the years pass, a permanent memorial can also become a link to the past for younger generations who may not have had the opportunity to meet the departed loved one during their lifetime.